Even large amounts of manufactured nanoparticles, also known as Buckyballs, don't faze microscopic organisms that are charged with cleaning up the environment, according to Purdue University researchers. In the first published study to examine Buckyball toxicity on microbes that break down organic substances in wastewater, the scientists used an amount of the nanoparticles on the microbes that was equivalent to pouring 10 pounds of talcum powder on a person. 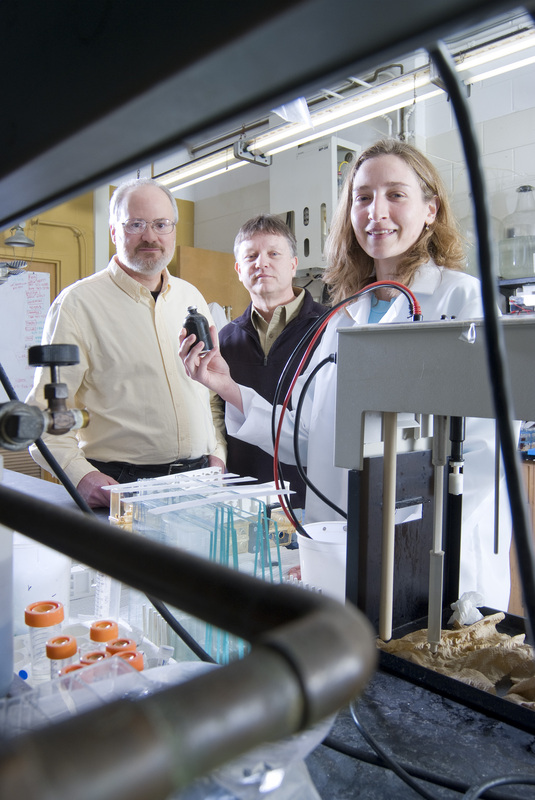 Because high amounts of even normally safe compounds, such as talcum powder, can be toxic, the microbes' resiliency to high Buckyball levels was an important finding, the Purdue investigators said. The experiment on Buckyballs, which are carbon molecules C60, also led the scientists to develop a better method to determine the impact of nanoparticles on the microbial community. "It's important to look at the entire microbial community when nanomaterials are introduced because the microbes are all interdependent for survival and growth," said Leila Nyberg, a doctoral student in the School of Civil Engineering and the study's lead author. "If we see a minor change in these microorganisms it could negatively impact ecosystems." The microbes used in the study live without oxygen and also exist in subsurface soil and the stomachs of ruminant animals, such as cows and goats, where they aid digestion. "We found no effect by any amount of C60 on the structure or the function of the microbial community over a short time," Nyberg said. "Based on what we know about the properties of C60, this is a realistic model of what would happen if high concentrations of nanoparticles were released into the environment." The third naturally occurring pure carbon molecule known, Buckyballs are nano-sized, multiple-sided structures that look like soccer balls. Nyberg and her colleagues Ron Turco and Larry Nies, professors of agronomy and civil engineering, respectively, report their findings in the current issue of Environmental Science and Technology. "This is a fundamental study to assess the environmental behavior of these important manufactured nanoparticles," Turco said. "Our findings help to lay the groundwork for a larger research agenda, which includes timely risk assessment of many types of nanomaterials in different environments." Nyberg analyzed microbes in each of three domains of a genetic tree - bacteria, archaea and eukarya - all including microorganisms that play a part in breaking down organic matter. Previously, researchers doing environmental risk assessment had not investigated organisms from the three domains in one study. Because various microbes function at different stages in the breakdown of organic matter, studying members of each domain is essential to gauge whether C60 is altering microorganisms and their function, Nies said. The scientists added varying Buckyball concentrations to wastewater sludge to determine if the nanoparticles affected the microbes. The highest amount of carbon molecules used was the equivalent of an average-size person being coated with about 10 pounds of talcum powder. Although a massive dose of even nontoxic substances could make someone ill, the high concentration of 50,000 mg of C60 to 1 kg of sludge didn't affect the microbes. "Nanomaterials are certain to be released into the environment with the increased manufacture of products containing them, such as moisturizer, sunscreens and other personal care items," Nyberg said. "One way they'll get into the environment is through wastewater treatment plants." A concern that has been expressed is that release of nanoparticles into water or soil could harm people, animals and the environment. On the other hand, Buckyballs have very low solubility in water. Water solubility usually is directly related to the extent and rate at which cells could absorb a substance, called bioavailability, which is an important factor in a chemical's toxicity. "We added really high concentrations of the nanomaterials to these microcosms and we still didn't see any effect," Nyberg said. "Probably a lot of that is due to lack of bioavailability." The Purdue team used two methods to determine if Buckyballs were changing how microorganisms did their jobs. One was a widely used molecular biology technique that enables scientists to analyze the genetics of an organism. The other was to measure the output of carbon dioxide and methane, two gases released as microbes degrade organic matter. No tools exist to measure nanoparticles in the environment, so methods that Nyberg developed for assessment of their effects will be essential for further research, Nies said. The scientists still have questions about Buckyballs that will require longer-term studies than the three-month duration of this one. Future investigations of Buckyballs also would include exposing the microbes to C60 multiple times. However, the scientists expect their next investigation will focus on nanotubes, a tube-shaped carbon nanomaterial that experts say are 100 to 1,000 times stronger than steel, Nyberg said. Because of their shape and strength, researchers are quickly finding many uses for them such as miniscule wires and electronic devices. "Research on the effects of nanotubes is urgent because development and application of nanotubes is moving much faster than for Buckyballs," she said. "Environmental scientists have not kept up with it." The research methods for the Buckyball assessment will be invaluable for future studies on nanomaterials, Nies said. "If nanotubes are released into the environment, we must have a way to know how much is there because we don't have ways to extract and measure them," he said. "Leila's techniques will play a big role in investigating how nanotubes react with the microbial community." The full name of Buckyballs is Buckminsterfullerene. Also commonly called fullerenes, these nanoparticles are named after American architect R. Buckminster Fuller who designed the geodesic dome that was once popular in modern architecture. The other naturally occurring pure carbon molecules are graphite and diamonds. Manufacture of Buckyballs, which began in 1985, led to a Nobel Prize in chemistry. The National Science Foundation provided funding for the Purdue scientists' environmental assessment.